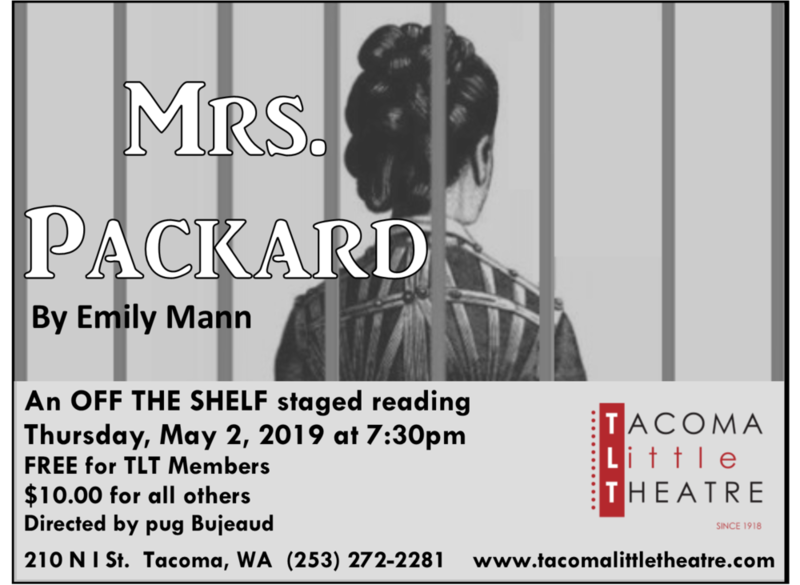 Tacoma Little Theatre's Off the Shelf program presents a workshop performance of Measure for Measure, a drama by William Shakespeare, adapted and directed by Christian Carvajal and read by a "who's who" list of South Sound thespians. This production will play Thursday, January 31, 2019 at 7:30pm. The Bard's poetic language has been preserved, with only a few outdated words swapped for modern synonyms. Written around the same time as Othello and King Lear, Measure for Measure has long been regarded as a "problem play," in that its conclusion seems to lack the justice its heroine demands. ("Some rise by sin," Lord Escalus observes, "and some by virtue fall.") The rise of the #MeToo movement makes it painfully clear, however: In the real world, justice for women is an ideal our civilization seldom achieves. A play Shakespeare wrote over 400 years ago can only now be appreciated as his most trenchant commentary on our quest for sociopolitical equality. Measure for Measure features the talents of: Andrew Fry, John Pratt, Andrew Gordon, Xander Layden, Jed Slaughter, Gabriel McClelland, Amanda Stevens, Drew Doyle, Mason Quinn, Chris Serface, Robert McConkey, Cassie Jo Fastabend, Silva Goetz, James Wrede, Jess Allan, and Kathryn Philbrook. Tickets for the January 31, 2019 performance at 7:30pm are $10.00 for non TLT Members, and FREE for those who are members. Tickets may be purchased online at www.tacomalittletheatre.com, or by calling our Box Office at (253) 272-2281. Tacoma Little Theatre and Toy Boat Theatre presents a “progressive” staged reading of Top Girls by Caryl Churchill, on Wednesday, April 13, and Thursday April 14, 2016 at 7:30pm. The production will be directed by Marilyn Bennett. Top Girls, written in 1982, is British playwright Caryl Churchill’s homage to women who knock on the glass ceiling, yet a cautionary tale about the sacrifices inherent in rising in an oppressive hierarchical society. Opening with a brilliant, wine-soaked celebratory dinner with five progressive women from history, the play follows Marlene, newly promote to Manager of the Top Girls Agency, through a reckoning with the life (literally) that she gave up to get there. In this TBT treatment conceived by Marilyn Bennett, the audience will attend the opening dinner scene in TLT’s cabaret-like lobby (food and libation for purchase), then move into the theatre to watch how things develop at the agency, traveling back to the lobby to witness the reunion of Marlene and her sister Joyce, in Joyce’s kitchen. There will be two 10 minute intervals to transition from space to space. Tickets for the April 13th & 14th performances at 7:30pm are $10.00 for non TLT Members, and FREE for those who are members. Tickets may be purchased here, or by calling our Box Office at (253) 272-2281. Tacoma Little Theatre presents The Tenth Muse by Tanya Saracho, on Thursday, January 28, 2016 at 7:30pm. The production will be directed by Randy Clark. In a lively 18th-century convent in colonial Mexico, young nuns and servants unearth a hidden play written by Sor Juana Inés de la Cruz, a nun and famous intellectual who died 20 years earlier after falling out of favor with the church. At night, behind the back of the Mother Superior, they act out Sor Juana’s ribald farce, revealing her blazing, blasphemous talent...and discovering their own complex bonds of sisterhood. Tickets for the January 28, 2016 performance at 7:30pm are $10.00 for non TLT Members, and FREE for those who are members. Tickets may be purchased here or by calling our Box Office at (253) 272-2281.